“Up to forty (40) years no one among the fishing community on Saguti, Masolya and Jaguzi Islands in Mayuge district had ever been immunised. There was generally a very low uptake of immunization services and low attendance/utilization of other health services like antenatal and family planning. With only three (3) Health Centres built and ill equipped to serve seven (7) islands, limited use and access to health services was the lifestyle of most fishing communities. Apparently no ambulance could work in these places, while health workers too shunned staying on the island. And as a result, mothers relied heavily on the expertise of the traditional birth attendants (TBAs) while the rest lived by self medication and God’s mercy” thus revealed Michael Gwanjaye, the Project Coordinator of Uganda Development and Health Associates–(UDHA). UDHA is an IDF grantee promoting maternal and child health rights among the fishing communities in Mayuge district. In collaboration with several stakeholders; District health office, facility medical personnel, Village Health Teams (VHTs), mothers, political and civil leaders, UDHA has been able to reach over 7796 people in the sub counties/islands of Bukaboli, Jaguza and Malongo with information on maternal and child health rights. This has been through routine radio talk shows, radio jingles community sensitization out reaches, door to door sensitization campaigns, quarterly feedback and sensitization meetings with key stakeholders, community dialogue meetings with duty bearers, publication and dissemination of Information Education and Communication (I.E.C) materials in popular versions. Aimed at increasing the level of involvement of fishing communities in planning, monitoring, and utilization of maternal and child healthcare services, UDHA’s project seems to be making progressive strides towards this goal. Available reports from these interventions and interaction with key stakeholders confirm this; For instance through continued lobbying and advocacy for the improvement of health services at Bwondha HC II, the longtime dilapidated HC was renovated by the district and supplied with a solar panel (that will be installed soon). This has not only improved its look but also attracted more mothers to utilize its services. Umuteesi Safina, the HC In-Charge notes that “in the past we would receive 10-15 mothers monthly while the rest used TBAS. It was even hard to convince them to come to the HC because it was in a poor state, but after its renovation realized through UDHA’s advocacy, coupled with the continued sensitization, we now receive 28 – 30 mothers monthly, we hope to even get more in the near future”. An increase in the number of people accessing immunization has also been witnessed; whereas the HC conducts immunization outreach services, mothers who deliver from home or on the way have come up to later bring their babies for immunization. Umuteesi further reveals that “since UDHA’s sensitization and education campaigns, the HC now immunizes between 150-200 babies monthly. These include those who deliver at the HC and from home - they after delivery bring the new born babies to the HC for immunization because they have been made to understand its importance”. Related to this is the improvement in utilization of family planning services; Available records at Bwondha HC II show an increase in the number of people accessing family planning from 10-20 people to 50- 150 monthly. On the other hand, male support towards women and child health rights has increased; unlike in the past when men did not find it necessary to participate in health related activities for their wives and children, say escorting them for antenatal, today, more men have come up to support their wives. At Bwondha HC for instance, over 30 couples are registered monthly for antenatal services as opposed to the past when only 7-10 couples would be received. Other impressive results from UDHA’s advocacy work are the recruitment and retention of Health workers at the HCs on the islands by the district, appointment of new Health Unit management committees to replace the expired and non functional committees at most of the HCs in the district and orienting of the same on their roles and responsibilities. Lastly is securing commitment from the District Health Officer to upgrade Bwondha HC II to a HC III facility. “A lot of change is being witnessed from UDHA’s work; we have been involved in most of the activities and are able to track what is changing. We are impressed by their work, and collaboration with us as a district and the other relevant stakeholders. Certainly the lives of mothers and children in Mayuge district are improving greatly”, noted the District Health educator, Mayuge district during an interview with him about the UDHA-IDF funded project. A baseline survey conducted by Rural Action Community Based Organization (RACOBAO) in 2013 indicated that there were rampant child rights abuses in Lyantonde district. Many girls as young as 14 years among the predominantly pastoralist communities were taken out of school to be given away in marriage. Community members were the main perpetrators of the abuses and as such could not report the rights violations, while those that tried were often frustrated by the weak structures such as the police, and local leaders in charge of children affairs; this was because they were either corrupt or outright incompetent. This incompetence was attributed to the lack of knowledge on the existing laws and policies on child rights protection and promotion. Most of the duty bearers were not aware of their roles and responsibilities in protecting and promoting child rights. However, through IDF supported interventions, RACOBAO (an IDF grantee) has been able to empower duty bearers with knowledge and skills in child rights promotion and protection. 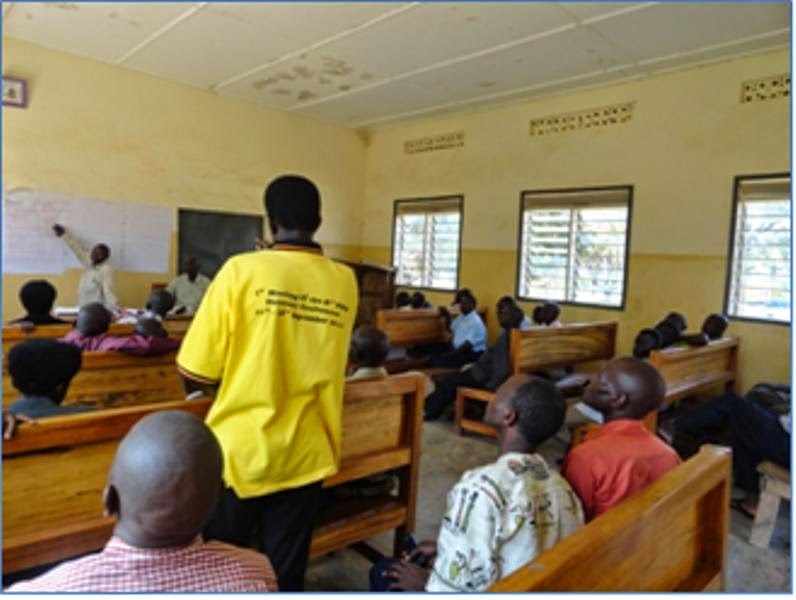 RACOBAO has continued to conduct several sensitization and dialogue meetings with the rights holders (community) and the duty bearers (leaders and service providers) to educate them on the existing laws and policies on child rights protection, and their roles and responsibilities towards the same. Community based interface meetings (barazas) have been conducted to allow for discussions between duty bearers and rights holders on issues of child rights protection. During these, several action plans are developed, implemented by the responsible persons and also monitored to check progress on what was planned. Reports indicate that the capacities of several community structures of duty bearers/service providers have been strengthened and their vigilance and responsiveness to handling cases of rights abuses reported has increased. On the other hand, increased vigilance on reporting cases of human rights abuse by the community members has also been witnessed. A case in point is where some community members in February 2014 whistle blew to the duty bearers about two arranged early marriages for one Daphne, a 15 year old girl from Kyalwandemu village, Kiyinda parish, Kaliiro Sub County and Babirye Allen a 16 year old girl from Bwamulamira village, Bwamulamira parish, Kinuuka Sub County. The community alerted the police about the planned give away ceremonies for these young girls by their parents. The police immediately swung into action, foiled the ceremonies and cautioned the parents and suitors never to repeat such a thing. The girls were later sent back to school and are happily studying. During a recent sensitization meeting, the District Probation and Social Welfare Officer noted “We are recording an unprecedented increase in the number of child rights abuses reported to and handled by my office. We call upon everyone in the community to join hands against abusing children”. Adding their commitment to the rest of the duty bearers, some religious leaders in Lyatonde district have vowed to always ask for birth certificates of brides before conducting marriage ceremonies. This is going to check on the number of early marriages conducted in the district. RACOBAO believes that, such measures if sustained will contribute a lot in wiping out the rampant child rights violations from Lyantonde district and consequently contribute to the national goal of human rights promotion and protection and the promotion of school enrollment, retention and completion for many children. 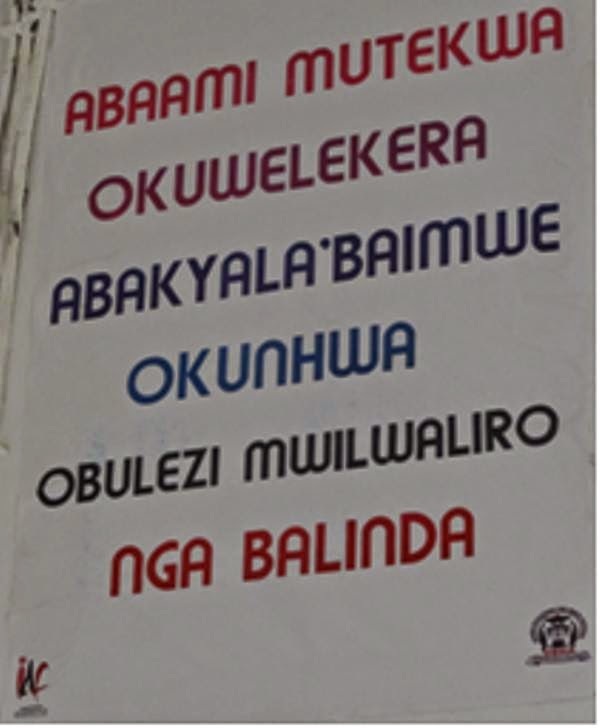 Serving approximately 56 patients a day, with just 8 staff out of the required 19 staff and with one ward- maternity ward serving as general ward too, the community and especially mothers in Nyakiyumbu sub county, Kasese District could not take it anymore. 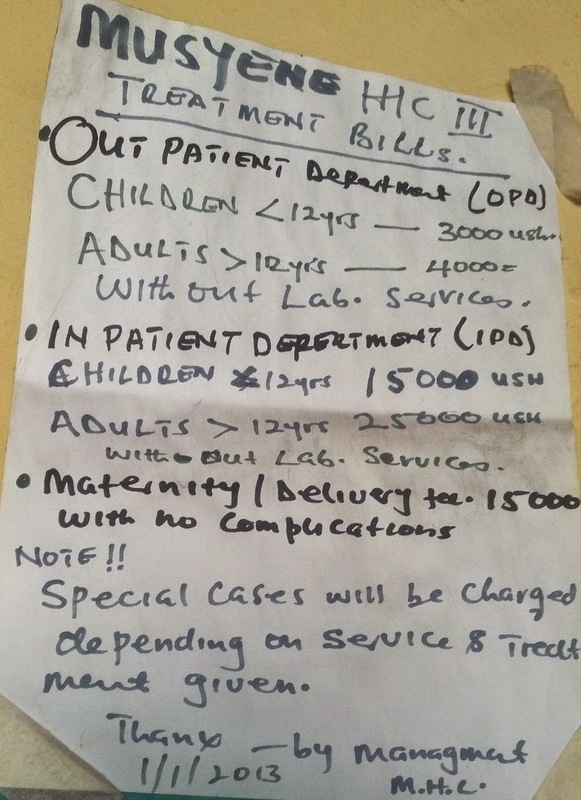 Although the start of in-patient services was a community demand driven initiative at Musyenene Health Centre (HC) III in Nyakiyumbu Sub County, the initiative doesn’t seem to be going well with the birth mothers who have to share one ward with the general patients (men, women, girls, boys and children as well). Apart from congestion in the one ward, there is no privacy for the mothers during and after labor. Apparently, the ward doubling as both maternity and general has only 15 beds but accommodates approximately 32 patients; most often children share beds while some adults sleep on the floor. HC In-Charge explaining to the community members on the progress of the general ward construction. In the bid to address this challenge, Ndongo Anti-Poaching Association (NAPA) Neighborhood Assembly under KALI took this issue up in September 2013 and discussed it with the sub county leadership. KALI further followed up the issue with the HC administration and the sub county leadership who agreed to organize a fundraising function for the completion of the general ward. And on 30th March 2014 a fundraising function officiated over by the Area MP Hon. 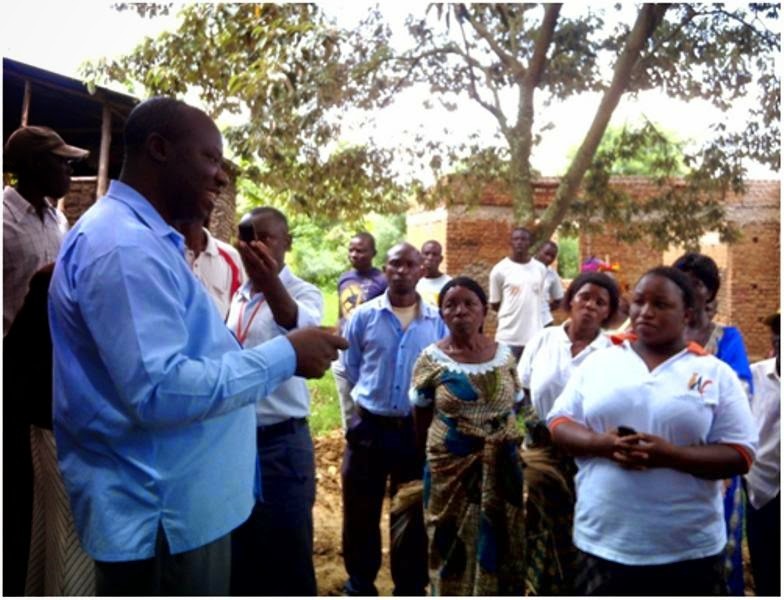 Dr. Crispus Kiyonga, and attended by 327 people (156 males & 171 females) was held at Musyenene Health Centre III. The participants who included, community members, CSO representatives, religious and cultural leaders, political and civil servants raised a sum of shillings 17 million, while other leaders like the Kasese District LCV Chairperson Hon. Ddula Mawa pledged materials; timber and iron sheets to roof the ward. Construction of this general ward which had stalled at window level later resumed on 18th April 2014 by Ayub a local mansion. Completion of the general ward is expected by March 2015. With the general ward in place, KALI and the general community are optimistic that this will improve service delivery at the HC and foster better health among the community in Nyakiyumbu Sub County. 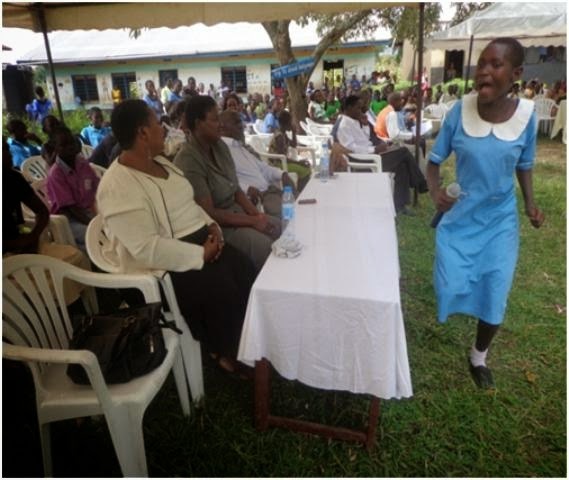 Annet Kabugho conveying her message in a song during the Neighbourhood Assembly. These are the voices of pupils at Kinyamaseka primary school in Munkunyu Sub County, Kasese district that had for the past 6 months been subjected to tilling the school farm instead of studying. According to monitoring reports by KALI (an IDF grantee) working in the area, a total of 560 pupils (286 males&304 females) between primary three and seven classes worked on the school’s 4 acre maize farm every morning from 8:00am to 11:00am. This is more than a half of the school because the school’s enrolment is of 753 pupils (371 males and 382 females). Whereas the introduction of school gardens initiative by SNV (where the school gardens work as demonstration gardens) is good because it is geared at promoting food productivity at house hold level and also provide food for the teachers; the practice is cheating children of their study hours which will consequently lead to poor grades. Monitoring reports indicated that pupil absenteeism had gone high especially in the morning hours, as most pupils tended to stay at home for fear of working on the school garden. According to the head teacher, Mr. Bathlemew the initial strategy of school gardening looked at parents as the source of labor but because of their limited support towards school activities, the school resorted to using the pupils partly because the garden is the school’s agriculture demonstration garden. “...this is a demonstration farm for agriculture lessons, and community farmers; it is a source of income for the school and food for the teachers” the head teacher noted. Worried about the future of their children, parents used Kinyamaseke Tukolerehaghuma Women Association (KITWA) Neighbourhood Assembly (NA) sitting on 12th May 2014 to discuss their grievances and appeal to the sub county leaders (the LCIII Chairman Hon. Josephat Bwambale and the Sub County Chief Mr. Biminya Francis) present to intervene and ban child labour at Kinyamaseke primary school. “I am disappointed at the way the school is exploiting our children, using them on the farm during the best hours of the day when they would be concentrating in class. Some pupils have started dodging school because they fear to participate in this mandatory activity- this must stop” asserted Sadik a parent, during the neighbourhood assembly. Responding to the parents’ concern, the LCIII Chairman and the Sub County Chief condemned the act saying it was pushing children out of school instead of encouraging them to study. They promised to work with the school to stop this ugly practice with immediate effect. Speaking at the assembly, the head teacher apologised to the parents for this practice and also promised to stop it immediately. He however asked parents to support this school project and provide labour in any way they can. KALI has since been visiting the school to follow up on their commitment to end child labour and to sensitize the teachers and school management to devise other means of finding labour for the farming activities at the school. KALI learnt that the school has stopped this practice; children are now attending classes regularly from morning to evening without disruption. Neighbourhood assemblies are community based forums composed of community members and local leaders who sit regularly to discuss pertinent issues affecting their community and also suggest/identify solutions to them. KALI is using this neighbourhood assembly strategy to implement its IDF funded project “promoting human rights and good governance in Kasese”.